We studied patterns of paternity in 840 nestling bobolinks (Dolichonyx oryzivorus) from 191 pairbonded adults and the chicks they reared in west central New York, USA, during 1983–1986, using allozyme data (4 variable loci). Thirty-six (4.3%) nestlings exhibited genotypes that excluded a putative parent as a genetic parent. Using the method of Westneat et al. (1987) we estimated that 14.6% of the nestlings were sired by extrapair copulations and that 28% of the nests contained ≥ 1 nestling resulting from extra-pair fertilizations (EPFs). Rates of EPFs did not appear to be related to population density among our bobolink populations. Younger males and older females were more likely to have young in their nests sired by EPFs than were older males and younger females. 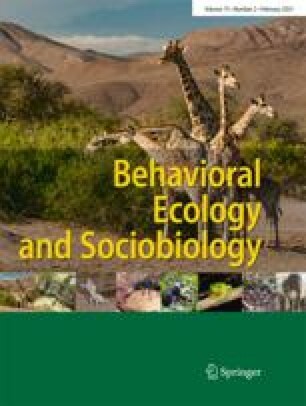 Primary females (i.e., firstmated) of socially polygynous males were more likely to have young sired by EPFs than were secondary females; socially monogamous females had intermediate rates of mismatched offspring. Nestlings resulting from EPFs were not more frequent in nests of socially polygynous males than in nests of socially monogamous males. Males responsible for EPFs were probably nearby (within 2 territories) residents.